According to the United Nations, Earth’s population is expected to grow to 9.7 billion people in 2050. As our population grows, this poses new challenges to monitoring the environment and climate change. As a result, there is a growing need for remote sensing of the environment at a global and local scale. The two biggest global Earth observation initiatives for the environment are ESA’s Copernicus Programme and NASA’s Earth Observatory. But for the local environment, there are some national and local ad-hoc efforts. Here are some of the ways remote sensing is solving local and global environmental issues currently. The goal of the European Space Agency’s (ESA) Copernicus Programme is to achieve a completely autonomous monitoring system. So its purpose is simple – understand the health of the Earth. Copernicus’ six Sentinel satellites collect comprehensive images of Earth. For this program, remote sensing of the environment is seen as the land, ocean, atmosphere and climate change for emergency response and security. Overall, there is nothing as ambitious as ESA’s Copernicus Programme. 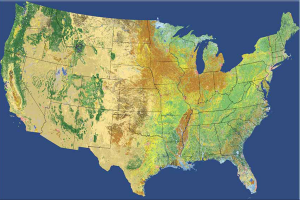 Since 1999, the NASA Earth Observatory has gathered a wealth of information on our environment and climate. If rainforests are disappearing in Brazil, you can see it for yourself from space. From Earth’s atmosphere to vegetation, NASA’s A-train fleet investigates Earth every day. You can see how much Earth changes with its animated, user-friendly global maps. For example, watch how aerosol, temperature, vegetation weather patterns and carbon monoxide changes month-to-month for over a decade. There are several applications for remote sensing of the environment at a local scale. With satellite constellations from Planet, we are just starting to get the coverage to monitor our land, water and air. 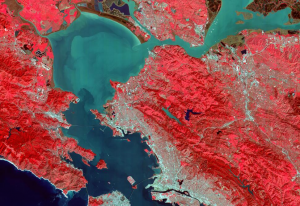 Alternatively, you can harness some of the sharpest multispectral imagery with DigitalGlobe’s fleet of satellites. 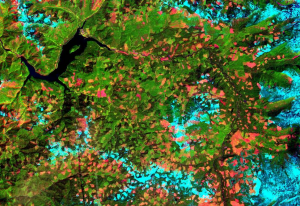 For the local environment, here are some remote sensing examples that’s responding to the effects of natural and human activity. In order to build a large-scale construction project (pipeline, transmission line), it’s the law to obtain a license by means of an Environmental Impact Assessment (EIA). An EIA measures the anticipated effects on the environment from the project footprint. For remote sensing of the environment, how will the project footprint affect the environment? In this case, we need land cover data. While ‘land cover’ is the physical property of the surface, ‘land use’ identifies how people use the land. So does it make sense to build along an existing road or through a wetland? First, we need to identify where the wetlands are. We often use image classification techniques like object-based image analysis (OBIA) to create land cover data. We have various types of land cover. For example, a wetland inventory delineates wetlands by types and function. A crop inventory stores the type of cultivated fields over time. A soil inventory identifies soil order and type. Ecologists are now turning to satellites for counting animal population. For example, it’s not easy to get reliable counts for polar bears in the Arctic. But for temporal studies, they don’t miscount polar bears as big boulders if they move in each scene. So now, satellite imagery is a tool to track Arctic wildlife like polar bears because of the remoteness and logistical constraints. And here’s another use of having reliable and accurate land cover data. We can study animal habitats and protect their land type. For example, fragmentation from road infrastructure can have significant impacts on endangered animals. Using GPS telemetry, we can understand which habitats animals occupy and conserve them using habitat suitability models. Using trilateration and a constellation of satellites broadcasting signals, this is how GPS system systems work. For example, lightweight telemetry collars receive GPS signals and can track the long distances migrating animals travel. Because birds often live in wetlands and forests, wildlife managers use light detection and ranging (LiDAR), multispectral and radar to show forest properties like vertical structure and phenology. Turns out, you can learn a lot about a lake’s health by studying algae. This is because it’s an indicator of the amount of nitrogen and phosphorous that is being fed into the lake. And reducing nutrients is important because if affects local economies that rely on freshwater like fisheries and tourism. Using multispectral and hyperspectral sensors, we can better understand the biochemical properties of algae blooms. Furthermore, we can map out dead zones where the lake is unable to support marine life. But the real question is: how do suspended solids enter and leave a river system? We already know the reflectance of water in satellite imagery increases with more suspended solids. But it’s from land cover data where we can see the health of riparian zones along the river. And a Landsat-8 pixel might not be able to do the job here, as riparian zones tend to be thin strips along the river bank. Despite 99% of glaciers are found in the Polar regions, at the same time it’s a unforgiving environment to live in. As glaciers slowly retreat due to climate change, this has profound effects on sea levels. This is why NASA’s GRACE satellite measures how much mass glaciers are losing from melting. And because of the remoteness and logistical constraints of its geography, satellites are ideal candidates for exploring, protecting and monitoring it. Because the Arctic may be one of the last great frontiers for human development, there is economic potential in mineral extraction, shortcuts for shipping route and natural gas. Satellites have kept a close eye on this relatively unknown area. For example, synthetic aperture radar (SAR) can track ships for the national defense. But for remote sensing of the environment, radar altimetry is particularly useful for monitoring sea ice thickness. The Landsat missions are the longest-running Earth observation in history. Since 1970s, we have a snapshot of Earth in time like a time capsule. Because of Landsat imagery, we can learn from the past for future generations. For example, this can prevent oil spills, deforestation, dead zones, smog and other man-made disasters. Comparing climatic factors from past to present has immeasurable importance for human survival. 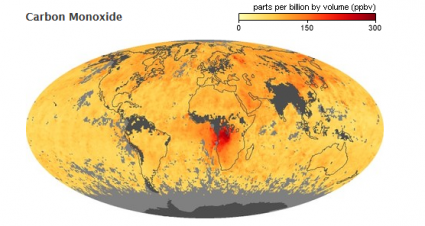 Because we can map climate variables like carbon monoxide, chlorophyll and aerosol size, we understand Earth’s climate better than we ever have. This includes remote sensing instruments like MODIS, CERES, AMSR-E, TRMM and MOPITT. In this day and age, you’d think we have our whole planet mapped out, right? But this isn’t true for the ocean floors, which is 70% of the planet. ESA’s CryoSat-2 and NASA’s Jason-1 satellites have revealed underwater mountains and seafloor topography using gravity-based measurements. And this includes the diversity of marine life in oceans. By monitoring sea surface temperature and ocean colors because, these are good indicators of specific fish species. For long-term sustainability of marine environment, satellites clarify algal blooms that are harmful to aquaculture. A geofence is a virtual geographic boundary. Whether it’s for security, retail or delivery, geofencing gives real-time alerts and increases awareness. It’s all about predicting risk in the insurance industry. Insurance technology like GIS and mapping can better manage risk with its location intelligence.